Other than the permanent resident delay problem, the surprising #2 line up outside my door question this late spring/early summer has been about International Experience Canada (“IEC”) Work Permit Extensions. Several individuals hold IECs and are now asking about obtaining Bridging Open Work Permits and Spousal Open Work Permits, hoping to rely on implied status to transition from to the other. This Moving 2 Canada post (I am not sure if they are qualified immigration consultants or not so I will just throw up big disclaimers here) captures well the uncertainty, confusion, and problem with how the law/regs often interfere with policy. I also found other examples of where IEC’s FB appears to condone implied status with the arbitrary 30 days before expiry rule – that also isn’t a “must” under law (?). Even as late as earlier this week I had an individual walk in my door stating that the call centre agent was adamant that they could not extend an IEC work permit/seek implied status. Here is the scene: Canada has signed several agreements with countries and organizations under the #IEC. Under these agreements, there are written in rules that limit the duration of stay to no more than 12 months. This extract is from our Youth Mobility Agreement with Slovakia. (b) they have complied with all conditions imposed on their entry into Canada. In short, other than the international commitments made to other countries through these youth agreements, there is nothing in IRPR stopping implied status UNLESS someone it was made a condition of the work permit that it was not extendable (#IRCC, please don’t get ideas). It seems to be a Government website wanting to not advertise it as an option in light of it’s other written commitments. 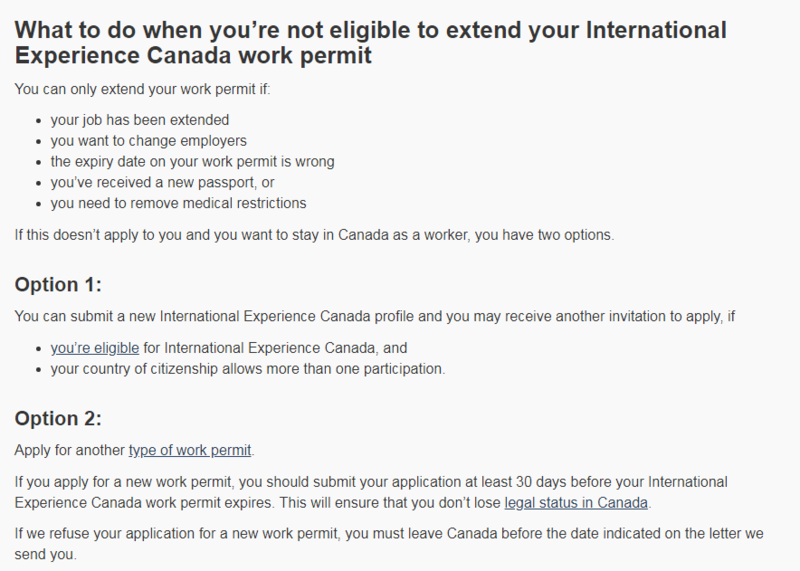 So far I’ve run into no push back but if there are cases of refusals, I query…..
Will this implied status period count towards permanent residency work experience? Can someone be removed from Canada per s.41, s.29(2) for working on implied status? Remember – implied status does not work the other way (for certain!). 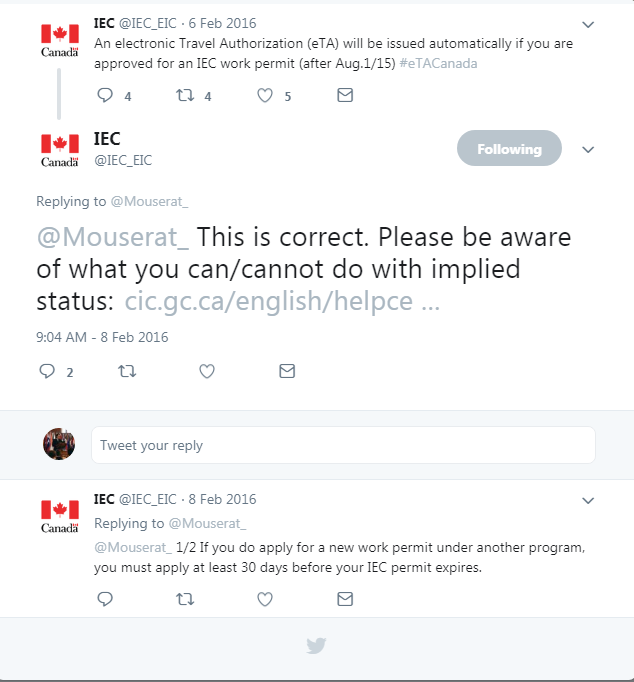 An IEC work permit is an application made outside Canada and therefore you need to physically obtain a WP approval letter before heading to the Port of Entry and/or applying at a foreign visa post! IRCC could use some clarifying policy on this! Applicants are getting confused. Looking for a Specific Immigration Issue? This site reflects my personal opinions and views only and should not be relied on and should be verified prior to any professional use. Please note that none of the information on this website should be construed as being legal advice. As well, you should not rely on any of the information contained in this website when determining whether and how to apply to a given program. Canadian immigration law is constantly changing, and the information above may be outdated. If you have a question about the contents of this blog, or any question about Canadian immigration law, please contact the Author. Please note that all comments posted to the Vancouver Immigration Blog are subject to the review of the Authors and that all immigration-related inquires will be handled privately and securely by competent Canadian Immigration lawyers. To book a consultation with a Canadian immigration lawyer email Will Tao at will. @edelmann.ca or call him at 604-646-4684.